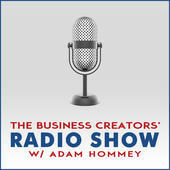 Thanks so much for listening to my interview with Adam Hommey on The Business Creators Radio Show. I hope you enjoyed listening to us as much as I enjoyed talking to Adam. He is a wonderful host who is enthusiastic about introducing you to the people and ideas that can improve your life.